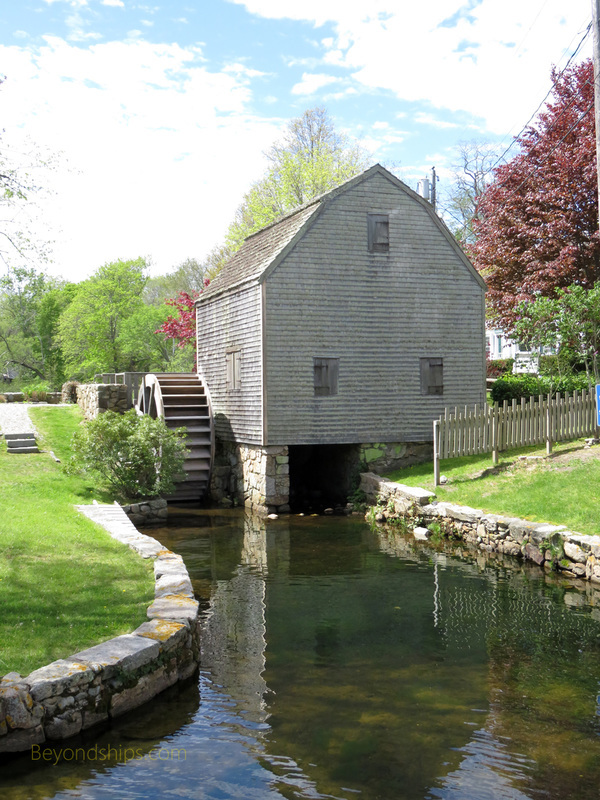 Above: The Dexter Grist Mill in Sandwich, Massachusetts. This was a full day shore excursion from Boston to Cape Cod listed as "Discovering Cape Cod.". Although I have sailed to Boston many times on a number of different cruise lines, this was the first time that I had seen this excursion being offered. Inasmuch as Cape Cod is one of America's leading tourist destinations, known for its history and miles of scenic shoreline, I was very excited to see this offering. Moreover, my family lived on Cape Cod for over 300 years and so this would allow me to see some of my ancestral homeland. Cape Cod is the hook-sharped peninsula that juts out into the Atlantic Ocean from southeastern Massachusetts. It was created as a terminal moraine by glaciers during the Ice Age. Since the completion of the Cape Cod Canal in 1916 near the base of the peninsula, Cape Cod has been technically an island. Indeed, it acts as a barrier island, protecting Boston and mainland Massachusetts from the full fury of the Atlantic. Legend has it that the Vikings were the first Europeans to visit the Cape but there is no real evidence to support these claims. At the end of the 16th century, a number of European explorers visited the area. A few years later, the Pilgrims landed near Provincetown and established the first European settlement, greatly aided by the Wompoag Native Americans who were already living in the area. For the next two centuries, the Cape was primarily made up of agricultural communities. However, the thin glacial soil was not well-suited to growing crops. In addition, the demand for firewood resulted in the denuding of the forests and erosion. Consequently, by the 19th century, the economy of the Cape looked to the sea. During the next century, tourism grew to become the chief industry. Improving transportation from Boston, let city residents get away to Cape Cod's beaches. Meanwhile, the super-rich built summer “cottages” along Cape Cod's shores. Because of its scenic beauty and 400 miles of shoreline, some six million people visit the Cape each year. Most come during the tourist season, which lasts from Memorial Day to Labor Day. Inasmuch as there are only two highway bridges over the Cape Cod Canal, which separates the Cape from the mainland, traffic jams during the season are legendary. The ship I was on, however, called in Boston on a weekday in early May. The estimate was that it would take about two hours for us to get to Cape Cod. However, driving on super highways, our bus managed to cover the distance in about an hour and a half. The only traffic jams we encountered were when we arrived back in Boston during rush hour. Cape Cod is a fairly big place - - 65 miles long and up to 20 miles wide. Thus, you cannot expect to see everything it has to offer during a nine hour tour. Therefore, this tour was designed to show some of the variety of the Cape by stopping at three places that are quintessentially Cape Cod. Our first stop was in the Town of Sandwich just across the Cape Cod Canal in the area known as the Upper Cape. Founded more than 350 years ago, Sandwich sits in a wooded are dotted with historic homes. Sandwich's town center has a quintessential New England look. The Greek Revival style Town Hall (1834 ) is adjacent to s small park with a Civil War memorial. Churches with tall steeples and homes with characteristic New England architecture sit well away from the main road. The focal point of our visit was the Dexter Grist Mill. Built in 1854, it was a water-powered mill used to grind corn and other staples and is now a museum. We did not go into the museum but rather took in the view of this shingle and clapboard classic on the banks of a large mill pond. From whichever direction you viewed the mill, the scene was like something out of a 19th century landscape painting. Nearby was the Hoxie House, one of the oldest houses in Massachusetts, built around 1675. It is a classic saltbox design and has a pretty green backyard, which slopes down to the shore of the mill pond. Yet another classic here is the Congregationalist Church of Sandwich. With its soaring white steeple, it is the epitome of a traditional New England church. Indeed, it so speaks of traditional religion that Elvis Presley used a photograph of it as the cover for “How Great Thou Art,” an album of hymns that he performed. We were not given a formal walking tour of Sandwich. Rather, the tour participants decided what they were going to do with the half hour or so we were in town. A few went into the Sandwich Glass Museum but most chose to stay outside in the sunshine and explore the area. The tour guide stayed nearby to answer questions.